Caroling for Workers' Rights at Verizon. On Saturday morning, we learned that our crew has a knack for singing carols, especially when it's about justice for working families. Community members came out to send a message to the Verizon upper management: our community will not support companies that are trying to slash the wages, benefits and working conditions of thousands of its employees, while the company's profits are high. 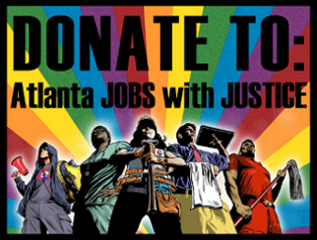 Great to have Atlanta JwJ coalition members including the CWA local 3204, CWA local 3250, Teamsters local 728 and the Metro Atlanta DSA out there working it. To make it through the day! He knew North Pole politics. They worked in non-union shops. They’re all getting premium pay.